I don’t get this “Mega Man 11” thing! It just looks like Capcom is trying to rip off Mighty No. 9! 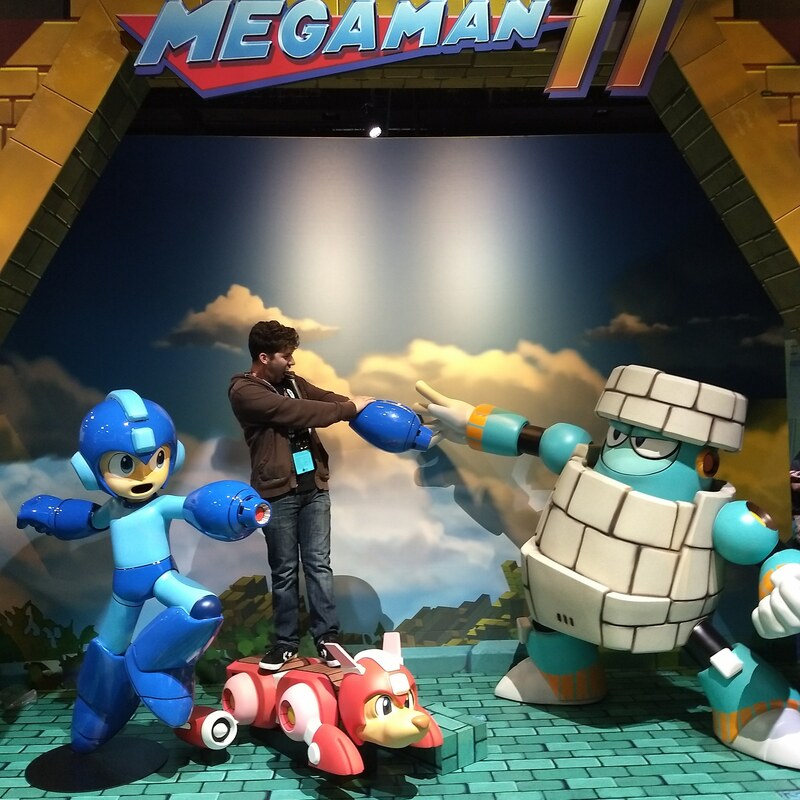 All joking aside, I got to play Mega Man 11 at E3 today (after an excruciatingly long wait in line), and walked away very impressed with the game, which is now on my radar as one of my most anticipated titles of the year. When Mega Man 11 was first revealed, a lot of fans were disappointed with the new visual look, and wanted another 8-bit throwback title. Personally, I think making another 8-bit entry would have felt a bit tired by this point. Besides, Mega Man 7 and 8 weren’t 8-bit, so it’s not as if Mega Man 11 is the first entry to go against the series’ NES roots. One concern I did have though, was that the new look may have meant a new direction for the series’ difficulty, and maybe ease things up a bit to grab a new audience. I’m not one of those people who demands that every game be extremely difficult, and that any game that’s on the easy side is automatically bad. But in Mega Man’s case, the difficulty is as much a part of the series as the Blue Bomber’s ability to steal the powers of defeated Robot Masters. Although only one stage was available in the demo (Block Man’s), it proved to be pleasantly challenging. Perhaps more importantly, the challenge was brought about by some creative ideas in the level design, with the standout moment being Mega Man navigating through confined rooms which are on a conveyor belt heading for an insta-kill grinder. Mega Man has to shoot path-blocking stones, and navigate the rooms by jumping and sliding in order to escape them and, by extension, escape the grinder. But once one such mini-room is completed, there’s another one in line on the conveyor belt. It’s concepts like that why platformers remain one of gaming’s greatest genres. Even with a template as old as Mega Man’s, getting creative with the level design is all the developers need to make things feel new again. Additionally, Mega Man now possesses an ability to slow down time for a short while, with certain level elements and enemies taking advantage of the mechanic. One enemy hides within a spinning wheel, which has only a small opening for Mega Man’s blast can make it through. While Mega Man can time his blast to destroy the enemy under normal conditions, the enemy’s wheel spins fast enough to make it difficult to get the timing down. That’s when slowing down time comes in handy, as it turns the small opportunity to hit this particular enemy into a much bigger one. The time-slowing mechanic is a fun little twist on the Mega Man formula, and hopefully a few similar mechanics are introduced to keep things fresh. 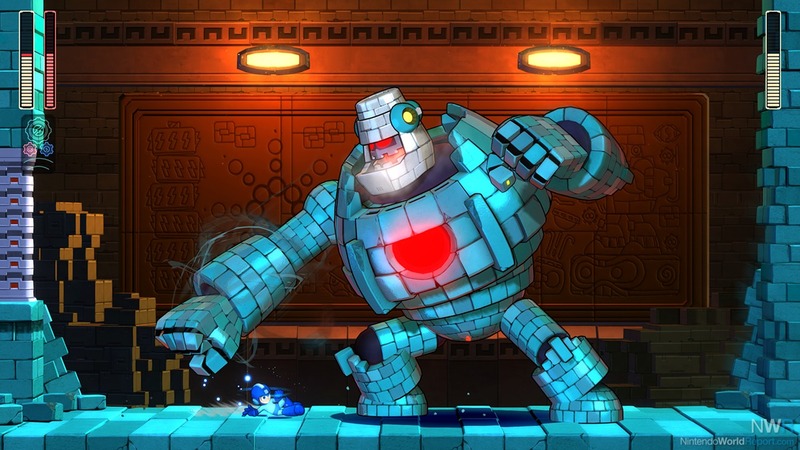 From what I can gather from my limited experience with the game, Mega Man 11 looks to not only revive the series after a notably lengthy absence, but also adding to the series’ norms in ways to make it feel like a proper continuation for the franchise, and not simply a throwback. I was tentatively excited for Mega Man 11 when it was announced, but after playing a stage of the game, it’s really looking like the Mega Man title the gaming world needs…especially after Mighty No. 9. Awesome impressions! I am glad to hear the game is coming along nicely. I can’t wait to play this game and make the bad guys cry like a would-be video game marketer on prom night! Joking aside, I really am looking forward to seeing what this game throws at us. You’re right, the 8-bit style worked for 9 and 10, but had it gone on like that, it would’ve geared itself to stagnate just like the original six NES installments. Plus with improved graphics come various new styles of gameplay simply not possible using the 8-bit style, and I’m sure they’ll take advantage of that in some way. 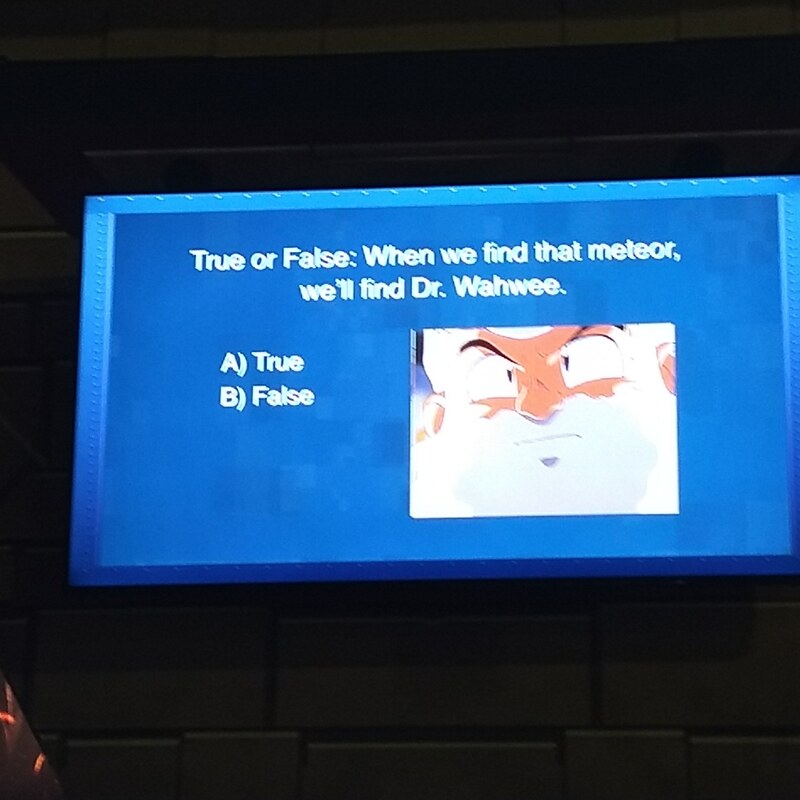 Also, you have a good point. With many big-budget AAA developers such as Naughty Dog, I think it’s easy for them to rely on their attempts at storytelling as an excuse to not polish the gameplay or level design. A series such as Mega Man generally doesn’t rely on its story, meaning the developers are going to be thinking almost exclusively about level design when it comes to delivering a quality experience, and that higher amount of focus really goes a long way. Haha! Nice one! these MN9 jokes are addictive…like, popping bubble wrap addictive! I loved the 8-bit style for Mega Man 9 and 10, but I wouldn’t want to see it again right now. Being someone who greatly enjoys Mega Man 7 and 8, it’s nice to see 11 basically being an evolution of their art styles. That’s basically why platformers are my favorite genre. They’re just pure gaming. That’s not to say anything against story-based games, and of course not every platformer is good, but I think the fact that everything about them revolves around the game design itself speaks volumes as to why the genre tends to produce more timeless titles than others. Next Next post: Spider-Man (Playstation 4) Delivers!